CARIGARA, Leyte – The P42 million worth of Farm to Market Road (FMR) projects through the Department of Public Works and Highways (DPWH) Leyte Second District Engineering Office implemented is now underway. In partnership with the Department of Agriculture (DA), the said project involves concrete paving of eight (8) farm to market roads in agricultural areas to help locals transport products to market towns. District Engineer Carlos G. Veloso reported that as of September, the project worth P6 million was already completed in Brgy. Tigbao connecting to Brgy. Romualdez in Dulag, Leyte. He added that the additional roads worth P31 million are still ongoing in Brgy. General Luna, Brgy. Sta. Isabel, Brgy. Liwayway connecting to Brgy. Danao, Brgy. Casuntingan connecting to Brgy. Osmeña in Mac Arthur, Leyte; Brgy. Calaghusan connecting to Brgy. Caltayan, and Brgy. Cogon connecting to Brgy. Buracan, La Paz, Leyte; and another road worth P5 million has Not Yet Started (NYS) in Brgy. San Agustin, Dulag, Leyte. Completion of FMR projects would increase agricultural productivity, employment opportunities and provide easier access to basic social services such as health centers and education facilities to the local residents. 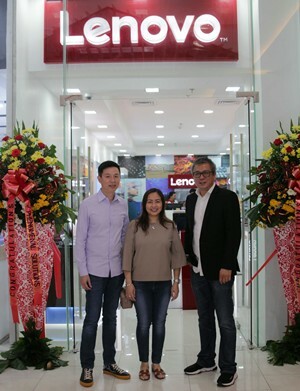 MAKATI CITY – Technology leader, Lenovo, has recently opened its newest concept store in Tacloban City, Leyte, as part of efforts to bolster presence in the Philippines. This is the company’s first concept store in the Eastern Visayas region. Leading PC and smart devices developer Lenovo recently opened its first concept store in Leyte as part of efforts to bring its services closer to customers in the region. In photo from left to right: Eddie Uy, Managing Director of Electrocomputer Data Systems, Katherine Uy, CFO of Electrocomputer Data Systems, and Michael Ngan, Lenovo Philippines Country General Manager. There are currently 19 Lenovo Concept Stores serving clients in key cities across the nation. Lenovo Concept Store Tacloban is located at the second level of Robinsons Place Tacloban. It is open daily during mall hours from 10:00AM to 9:00PM. CAMP LUKBAN, Catbalogan City – The CPP-NPA Terrorists (CNTs) in Eastern Visayas belonging to the Efren Martires Command and Arnulfo Ortiz Command are misleading the public again with their misinformation regarding the murder of the former Mayor of San Jose de Buan Ananias S. Rebato. Ex-Mayor Rebato, together with his bodyguard Mr. Severino Tesoro, was attending a vesper party at Brgy. Babaclayon, San Jose De Buan, Samar when shots were fired leading to the instantaneous death of his bodyguard and one of the assailants. The former mayor was wounded but later succumbed to his injuries last October 13, 2018. The CNTs have owned up to the killing of Ex-Mayor Rebato in a press statement that is tainted with lies and propaganda against the military. They are deceitfully covering up their atrocity by saying that they had only punished the former mayor who they claimed was an intelligence officer belonging to the Intelligence Service of the Armed Forces of the Philippines (ISAFP). The communist terrorists are also falsely calling out the illegal arrest of one of the suspects by the military. To set the records straight, Ex-Mayor Rebato was not a member nor an officer of the Armed Forces of Philippines. Likewise, the arrest of the suspect identified as Arnel Babatio, 18 years old and a resident of Brgy. San Nicolas, San Jose De Buan, was made by the joint elements of San Jose De Buan Municipal Police Station and the personnel of 2nd Samar Provincial Mobile Force Company (SPMFC) thru a hot pursuit operation. Said suspect is in custody of the Samar Police Provincial Office awaiting trial for murder. The non-factual assertions of the CNTs are nothing but mere lies that they have created in order to disguise the crime they had committed against a citizen. The 8ID strongly condemns the brutal killing of ex-Mayor Rebato and his bodyguard perpetrated by the CNTs and extends its heartfelt condolences to the bereaved families, relatives, friends, and loved ones of the victims. “The Filipino people no longer believe in the lies of the CPP-NPA Terrorists. The killing of former Mayor Rebato is another proof that the only ideology they believe in is that of violence and terrorism,” Maj. Gen. Raul M. Farnacio, Commander, 8ID said. Read: NPA-Efren Martires Command statement on the death of Mayor Ananias Rebato. QUEZON CITY – Protests in several key cities and urban areas were held today to condemn the Resolution of Both Houses No. 15 (RBH No. 15), a new version of proposed changes in the Constitution sponsored by House Speaker Gloria Arroyo, along with 21 other lawmakers. “Duterte has long since harped on Cha-cha and federalism as the solution to the misery and poverty of the Filipino people. But with RBH No. 15, his ulterior motives are brought to the fore. Their version of Cha-cha is self-serving to say the least. It would not address the urgent concerns of the workers and the poor – skyrocketing inflation, starvation wages, contractualization, the continued defunding of social services in the national budget,” Partido Lakas ng Masa Coalition (PLM Coalition) spokesperson, Leody de Guzman said. He added, “RBH No. 15 paves the way for a more liberalized plunder of the national economy and the nation’s coffers, by foreign monopolies and political dynasties. It is an evil spawn – a Cha-cha, ‘nak – between Gloria Arroyo - a rabid pro-capitalist economist before she became president - and Rodrigo Duterte - the warlord from Davao and current resident of Malacanang”. The labor leader explained that RBH No. 15 removed the prohibition on political dynasties after failing to enact an enabling law to implement the ban on dynasties for more than three decades. “Without this, voters will be forced to choose the lesser evil among political clans, or between rival siblings of a ruling dynasty, in the upcoming May 2019 elections,” he expounded. The RBH No. 15 also junked the prevailing term limits for public officials. “The term limit brought discomfort to political dynasties as they were forced to transfer position to their spouse or their children in order to maintain in power. The Duterte-GMA Cha-cha sought a Gordian Knot solution to this overriding concern of political dynasties”. The RBH No. 15 also junked the entire section of the Constitution on “National Economy and Patrimony”. De Guzman said, “The spirit of the prevailing highest law of the land is ‘the Philippines for Filipinos’, hence the 40% limit on foreign corporations in select industries including their ownership on our resources – natural and man-made. This view is obsolete for neoliberal economists like Gloria Arroyo. Now, as if the liberalization of the local economy is not enough, they want a more liberalized set-up to entice more foreign investors to own our country. This proposal is very dangerous, if not treacherous, especially with the expansionist drive of Chinese capital, particularly in Southeast Asia”. The labor leader, who is also running for the senate, elucidated, “Even though the 1987 Constitution has defects, it has an entire article on ‘social justice and human rights’ it gave recognition to structural injustices in Philippine society. Hence, the creation of an entire article containing the rights of labor, agrarian reform and natural resources, urban land reform and housing, health, women, and the role of people’s organization, in order to protect the majority poor from abuses by the rich and the powerful”. “Yet, the existing Charter merely granted a nominal recognition to these rights because political power remained concentrated in the hands of the elite. The civilian population is virtually taken out of the political sphere in between elections. In RBH No. 15, some of these rights are scattered throughout the proposed constitution. But without recognition to the principle of social justice and the existence of structural injustices, these rights become ineffectual and illusory”. Member organizations of PLM Coalition held protests in several cities Friday against RBH No. 15. The mass actions, held in Manila, Laguna, Negros Occidental, Leyte and Cebu, also highlighted the urgent demands on gut issues such as the call for price control on all basic commodities, the scrapping of the TRAIN Law, abolition of contractualization, the enactment of a P750 national minimum wage and the repeal of the Oil Deregulation Law. CAMP LUKBAN, Catbalogan City – The 46th Infantry (Peacemakers) Battalion has returned to join the fight against the CPP-NPA Terrorists (CNTs) in Eastern Visayas after a decade of successful anti-insurgency campaign in Eastern Mindanao. The formal welcome ceremony was held at 8ID Battalion Retraining Facilities, Camp Eugenio Daza, Barangay Fatima, Hinabangan, Samar last October 16, 2018. In his welcome statement, Maj. Gen. Raul M. Farnacio recognized the men and women of 46IB for a job well-done in their contribution to the government’s campaign against the CNTs in Eastern Mindanao. “46IB’s homecoming will be of great help in strengthening the government’s effort towards conflict prevention, peace and development in conflict-affected areas in partnership with our stakeholders. The challenge, therefore, is for the Peacemakers to display their utmost commitment in addressing internal threats such as terrorism, criminality, and drug trafficking as these will result peace stability in the Region,” he added. 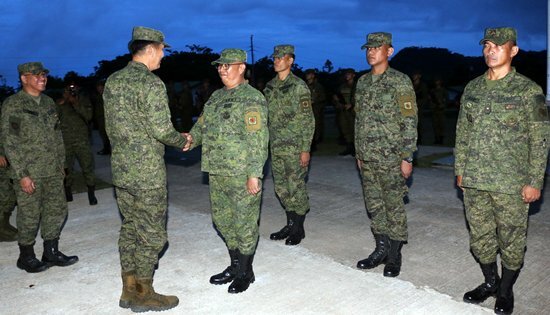 The return of 46IB as part of the Army in Eastern Visayas is also expected to strengthen the AFP-PNP’s effort in ensuring a peaceful and successful 2019 mid-term elections in Region 8. TACLOBAN CITY – The region reflected a deficit in the total balance of trade in goods (BoT-G) amounting to $53.5 million in July 2018 in contrast to the $120.8 million surplus in the same period a year ago. The region’s total trade in goods in July 2018 amounted to $85.2 million, a drastic drop of 67.2 percent from the $259.8 million level in the same period last year. Total exports amounted to $69.3 million, which was 0.2 percent lower compared with the $69.5 million in July 2017. Total value of imports, meanwhile, was recorded at $15.8 million, a severe drop by 91.7% compared with the $190.3 imports posted in the same period last year. The region’s total volume of exports in July 2018 was posted at 85.3 million kilograms. The commodity group of ores, slag and ash was the major exports during the month in review with total revenue of 33.0 million, accounting for 47.6% of the region’s total exports revenue in July 2018. Canada was the top export market destination with a total exports revenue of $33.0 million, which shared 47.6% of the region’s total exports. Meanwhile, the region’s total imports amounted to $15.8 million in July 2018 with total gross weight of 52.2 million kilograms. Mineral fuels, mineral oils and products of their distillation; bituminous substances; mineral waxes commodity group was the major import during the month with total revenue of $9.2 million, which accounted for more than half or 57.9% of the region’s total imports in July 2018. The top import supplier of the region was Singapore with a total imports bill of $6.7 million, which comprised 42.3% of the region’s total imports. The construction of P4.4M, 1 Storey 3 Classroom at Salangi Elementary School in Almeria town is one of the schools that will benefit of the newly completed building that can accommodate more or less 120 students. NAVAL, Biliran – The Department of Public Works and Highways (DPWH) Biliran District Engineering Office (DEO) has recently completed nine school building projects that would benefit the students in four towns of Biliran Province. The Province of Biliran is composed of eight towns namely Almeria, Kawayan, Culaba, Caibiran, Cabucgayan, Biliran, Maripipi and Naval, the capital town. In Culaba town, Biliran DEO has completed the construction of P3.1M school building, a 1-storey 2-classroom structure, and construction of P4.5M school building, 1-storey, 3-classroom both in Acaban Elementary School that would accommodate more or less 200 students of the said school. The construction of P13.6M, 3 Units 1 Storey 3-Classroom at Bool Elementary School also in Culaba town was also recently completed that will benefit more or less 360 students. In the town of Caibiran, the district office has also completed the construction of 1 Storey 4 Classroom in Caibiran Elementary School that will benefit at least 160 pupils. More or less 120 pupils will also benefit the newly completed construction of 1-storey 3-classroom in Katipunan Elementary School of the same town. The construction of P4.4M, 1-storey 3-classroom school building at Salangi Elementary School in Almeria town is also one of the schools that will benefit the newly completed building that can accommodate more or less 120 students. More or less 80 students will also benefit on the newly completed P3M, 1-storey 2-classroom in Bato Elementary School in the town of Biliran. Biliran DEO under the helm of District Engineer David P. Adongay Jr. has already conducted final inspections on these school building projects that are funded under Basic Educational Facilities Fund (BEFF) of FY 2017. As per inspection, minor defects and deficiencies were noted by the inspectorate team. Adongay orders contractors to immediately rectify the said defects and deficiencies of the building in order to turn over the projects in time so that it can be utilized by the end users. Biliran DEO has a total of 71 school buildings implemented under 2017 BEFF. Out of this number, the district office has completed 53 with 17 on-going projects and one Not-Yet-Started (NYS) with an overall accomplishment of 89.18% as of September 30, 2018. CAMP LUKBAN, Catbalogan City – The Philippine Army Candidate Soldier Course Classes 552-2018 (Mandilaab) and 553-2018 (Matalahib) were formally closed today, October 17, 2018 at 10 A.M. at the 8ID Grandstand, Camp Lukban, Brgy. Maulong, Catbalogan City, Samar. The closing ceremony was graced by a former Philippine Marine Officer himself, Dir. Henry Anthony M. Torres, Regional Director, Office of Civil Defense Regional Office VIII, Tacloban City as the Guest of Honor and Speaker who further led the ceremonial entrustment of firearms, distribution of certificates and awards of individual achievements. 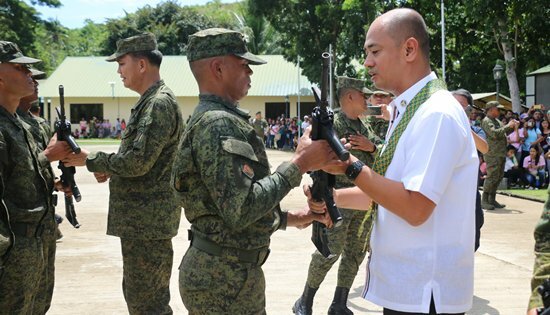 The entrustment of firearms to the 233 newly enlisted Privates symbolizes their responsibilities and commitment to the people and country. Dir. Torres reminded the newly soldiers of 8ID to value their chosen career, and to put more emphasis in the execution of their duties with self-respect and decency in order to uphold the core values of the Philippine Army and the Armed Forces of the Philippines as a whole. Meanwhile, Maj. Gen. Raul M. Farnacio AFP, Commander, 8ID in his inspirational message emphasized the importance of sacrifice in the military service. “Sa mga nagsipagtapos ngayon, mahalin at alagaan ninyo ang propesyon na pinasok niyo. Sana naliwanagan kayo na ang trabaho natin ay higit pa sa ating mga sarili. Bilang mga bagong sundalo ng Republika ng Pilipinas, mas malalim na sakripisyo ang kinakailangan. Sakripisyo na mawalay sa inyong pamilya para sa mas maginhawang kinabukasan at ang mas higit pa ay ang sakripisyo para sa ating bayan. Lagi ninyong tatandaan, Bayan muna bago ang sarili,” he added. Likewise, the 8ID commander lauded the Division Training School personnel who were responsible for the training of these new privates and thanked the families, relatives and friends for their support and trust to 8ID. TACLOBAN CITY – The Inflation Rate (IR) of Eastern Visayas continued to increase at 6.5% in September 2018. This IR was 0.4 percentage point higher compared with the 6.1% IR a month ago, and 3.0 percentage points higher than the recorded 3.5% IR in the same period last year. The regional inflation rate was 0.2 percentage point lower than the 6.7% national average in September 2018. Southern Leyte, recorded the highest increase of 1.4 percentage points, from 1.8% in August 2018 to 3.2% in September 2018. It is still, however, the lowest IR among the provinces during the reference period. Eastern Samar, on the other hand, posted the highest IR at 8.9% (Table 1). Among commodity groups, housing, water, electricity, gas and other fuels registered the highest increase of 0.8 percentage points. It was posted at 6.1% in September 2018 from 5.3% in August 2018. This can be attributed to the huge increase in the index of water supply and miscellaneous services relating to the dwelling. The heavily weighted food and non-alcoholic beverages went up to 9.2% in September 2018 from its previous month’s rate of 8.6%, an increase of 0.6 percentage point. This can be traced to faster price increases of corn, rice, non-alcoholic beverages, meat, and sugar, jam, honey, chocolate and confectionery products (Table 2). Inflation rate for furnishings, household equipment and routine maintenance of the house slowed down to 2.6% during the reference month, 1.2 percentage point lower compared with the 3.8% IR in August 2018. Similarly, alcoholic beverages and tobacco went down by 0.6 percentage point but still recorded a double digit IR at 21.2%, the highest among all commodities. Education and communication, meanwhile, retained their previous month’s rate of -16.2% and 0.3%, respectively. The Purchasing Power of Peso (PPP) of the region was recorded at P0.80 in September 2018. This PPP implies that goods and services worth 100 pesos in September 2018 only costs 80 pesos in 2012. Southern Leyte registered a minimal decrease of 0.02 centavo in its PPP in September 2018 compared with its P0.83 PPP a month ago. Eastern Samar, Leyte and Samar each recorded a 0.01 centavo decrease in PPP from August 2018 to September 2018, while the rest of the provinces sustained their PPP from last month. Leyte recorded the strongest PPP at P0.83 while Northern Samar and Samar posted the weakest PPP at P0.75. 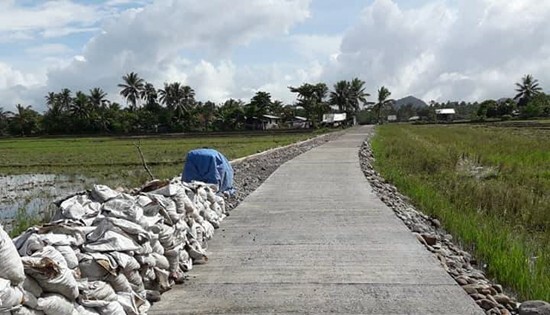 CALBAYOG CITY – Samar First District Engineering Office (SFDEO) completes the construction of two road projects in the municipality of Almagro, Samar with a combined appropriation of P100 million. Almagro is an island municipality accessed only by motorboat from the port of Calbayog City, taking usually up to 2 hours of travel. It is composed of 23 barangays and has a land area is 51.36 square kilometers. It is well-known as the center of the goat-raising industry in the province, native ipil-ipil and coconut trees. The only means of travelling from one barangay to another is through motorboats due to the lack of a road network within the island town. This hinders the trading of agricultural goods. 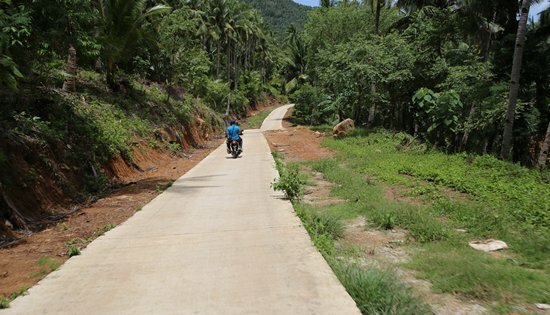 The first road project connects Brgy. Panjobjoban to Brgy. Poblacion, covering the construction of 1,919.92 meters of Portland cement concrete pavement (PCCP). The second road project links Brgy. Imelda to Brgy. Poblacion, covering the construction of 1,938.65 meters of PCCP with a thickness of 230 millimeters. Both projects are 3-meter wide half-lane roads. With the completion of these road projects, local fishermen and farmers can now easily exchange produce without the need for motorboats. This makes travel and transport easier, safer and more convenient. In 2019, SFDEO will propose the construction of a circumferential road project that will connect more barangays to the poblacion of Almagro.